There is no shortage of books about ‘how to write’. What sets this particular book apart from many of the others is that it’s … well … not really a ‘how to’ book at all. This is much more of a memoir of a writer. Because his life has primarily been about writing it’s not surprising that he writes about writing, and along the way Orion writes about his process, offering tips and suggestions. The subtitle makes this pretty specific toward someone interested in screenwriting and … creative storytelling. Is that a thing, specific like screenwriting? Or is that just intended to broaden the potential audience? Like many other writers and hopeful writers, I’ve read a great number of ‘how-to’ books. What I’ve learned is that there are as many processes to getting writing done as there are writers. What works for Dean Orion may not work for me or my friends. What Orion does nicely is include summaries at the end of the chapters and there are little snippets of advice that prove quite worthy here – though Orion is not the first (nor likely the last) to offer these bits of advice. I personally liked the advice he offers in Chapter 14: The Write Community – encouraging writers to surround themselves with a community of writers. We tend to think that writing is solitary profession, and it is, but only to an extent. Most writers need the support and encouragement that only another writer can truly understand. The advice and suggestions aren’t ‘bad’ but it’s not very complete and I wouldn’t go out of my way to recommend this to any of my writer or would-be writer friends. If it looks like it might appeal to you, then try it, but don’t expect too many hearty recommendations for this. Looking for a good book? 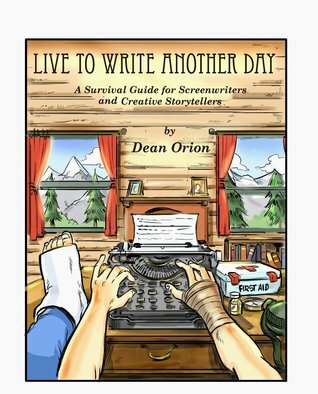 Live to Write Another Day by Dean Orion is a memoir/how-to-write book that is fine, but not worthy of a recommendation. I received a digital copy of this book from the publisher through Netgalley, in exchange for an honest review.